For the last several weeks we've been learning all about Nicolo Paganini using Music Appreciation Book 1: for the Elementary Grades from Zeezok Publishing LLC. During our review period we learned so much about the "Master of Strings!" The entire set includes seven chapter books (Paganini, Schubert, Bach, Handel, Haydn, Beethoven, and Mozart), a book of worksheets for each composer, a CD with lapbook pages for each composer, and a set of music CD's that have music for each composer. This could easily be an entire year's worth of music classes or more! Each composer has a four week breakdown of lessons, activities, and music. The workbook set out what chapters to read on each day, what worksheets to do with the kids, and what pages to work on for the laptop. It was easy and a no-brainer for mom! It also told you when to listen to the music and where you could find it on the CD's. The lapbook pages were easy enough for my 8 year old to complete on his own and his 5 year old little sister was also able to join in on the music lessons! I chose to read the chapters aloud to benefit both kids, but my 8 year old, who is a strong reader, could have read it on his own. The book was written in a narrative way. Paganini was a boy wonder, and we were able to relate to him in the story. It was a great story about determination, gumption, diligence, and perseverance. Even though his life wasn't the easiest, he continued to work hard through it all. We enjoyed reading the story and you could easily use that on it's own to complete a music history lesson; however, the worksheets added to the lessons. 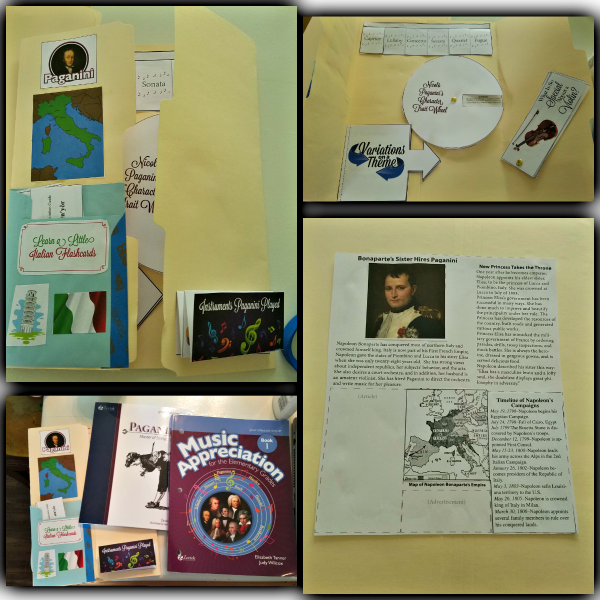 The worksheets and lapbook pages included ways to add in social studies, languages, geography, culture, and more subjects into your music class. I was impressed with the amount of information that was contained in the four weeks of Paganini! The worksheets were colorful and inviting for the kids to use. The lapbook is still being used by the kids even though we have finished learning about Paganini. Their favorite part is a section with Italian words and their meaning. They enjoyed learning the foreign language and practicing it with each other. The lapbook- worksheets are great, but being kinesthetic is better for young kids that don't want to sit still! A year (or more) of music lessons! If you don't have a strong reader you will need to be the reader for the kids. It can take a long time to read through a chapter, but it is worth it!